I EXPECT it fits in with the thinking of CaRT to do away with single day boat licences in favour of seven day ones—more cash from the boaters. The Trust will be ending the automatic online reduction policy, whereby the charity had previously removed one long-term online mooring for the creation of every ten off-line marina moorings. Over the past ten years nearly 600 online permanent moorings have been removed as thousands of new offline moorings have been created. That's a load of tosh. When Pillings Marinas was opened on the Soar, there being few linear moorings on that rather unsafe river it was decided to oust those off Sawley Cut, but those boaters caused a bit of a stink and were allowed to stay, resulting in no online boats being removed. Then came the new Chapel Farm Marina above Derwent Mouth Lock. Not only were no boats taken off online moorings, but Willowbrook Moorings for around 20 boats were created a mile up above Sharlow Lock—a complete reversal of the claimed policy! And every boater who has cruised the waterways over the last 10 years is very well aware that there are more online moorers than ever before, and all too many marinas with many empty berths. So 600 boats removed? A load of tosh indeed. That means even more tick-over time! And how sub-letting will be policed, God only knows, as I know one CaRT online mooring were it is rife, and nothing done about it. I should imagine that many of you boaters remember the policy started by British Waterways of encouraging marina building with its specialized unit offering all the help it can, resulting in many new marinas coming on line. There was not much loyalty in the scheme however, as there was no limitation on the number of marinas being built, and those investing soon discovering that it wasn't such a good investment after all as more and more were encouraged—BW and latterly CaRT getting a good whack of cash based of the number of berths. So what happens to the loyalty to them? They surely did not expect a free-for-all of moorings along the waterways, with even more boaters deserting their berths. It is quite a while since CaRT decided that a half sunken tyre was the thing to portray itself, at great cost, but alas, costs still abound. 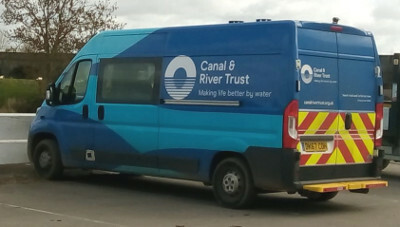 It has now been decided that its vans are not properly proclaiming the trust, having no clue of its new logo, so they are in the process of being re-painted. Not a simple inexpensive replacement of the logo, but a full blown transformation of a different design and colours—'We have the money, let's spend it' seems to be trend, and as we all know with its new 'well-being' policy of health and happiness, lets make it bold. How much money it has had to dig in its pockets to pay for this totally unnecessary creation, is needless to say not told, and alas, with Allan Richards no longer on the scene to ferret it out, we shall never know. I was pleased to see that more hydro electric schemes are coming into play on our rivers, which I have always thought the very best way of creating power, it being virtually free. Perhaps now, all that 'wasted' water rushing over the weir of the Trent at Sawley could at last be put to good use, and to hell with the fishermen who stopped it as, somehow or other, they reckoned it interfered with their fishing on the weir side when a hydro scheme was planned. Now I have cruised up and down the Trent by the weir countless times over the past 20 odd years, and yet I have never seen anyone fishing on the weir side of the river. Though there are the occasional ones further up river on the opposite bank, that surely cannot possibly be affected. I reckon it was nothing more than showing their misguided—and I use that word purposely—power. Our esteemed editor does not allow self praise of narrowboatworld, being of the thinking that 'self praise is no recomendation', but for once to hell with him, I'm going to point out that we published 24 articles in the past seven days, whilst others managed a a couple or in one case, none at all! So who's really No 1, eh?